Enter the Crazy Holiday Sweater Contest! Why be bland with your holiday sweater when you can be crazy fab! 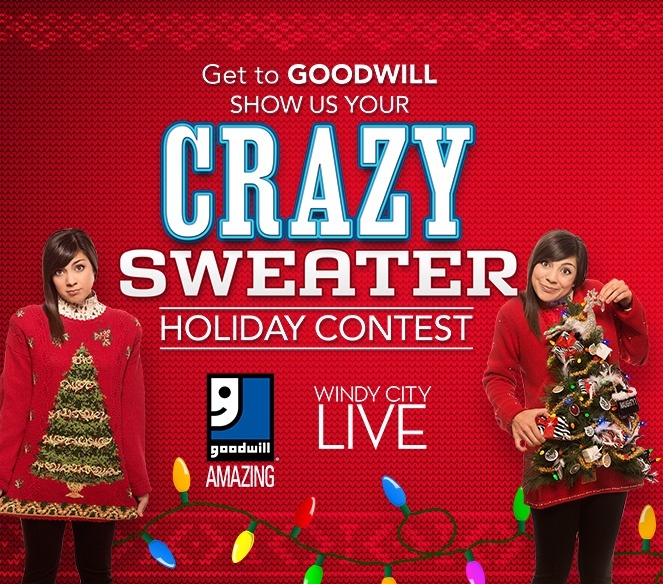 Enter Windy City Live’s “Get to Goodwill, Show us your Crazy Sweater” contest beginning November 21st! Simply visit your local Goodwill, pick out your perfect holiday sweater and dress it up to show your holiday spirit! Throughout Goodwill you’ll find countless items to take your sweater from ho-hum to ho-ho-ho! You never know what you’ll find at Goodwill, but you know it will be amazing. To enter, click the button below and upload a photo of your decked-out crazy sweater between November 21st and December 4th. One winner will win a fabulous trip for two to New York City to see Live! With Kelly along with a $250 Visa gift. Four lucky finalists will also receive a $250 Visa gift card. So get going and bedazzle those sweaters now!